Waterlox Pure Tung Oil is 100% pure tung oil with no additives or driers. Produces a matte sheen appearance. Highlights and richens the natural beauty of wood. Penetrates into the wood fibers. Water and heat resistant after a minimum of 7 days. Ideal for wood surfaces that do not require a film such as: salad bowls, butcher blocks, chopping boards, furniture (other than table tops), gun stocks, jewelry cases, wooden figurines, bowl turnings, etc. 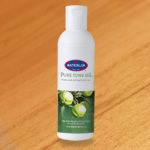 Can be used on wood floors; see our flooring application guide for instructions. Use on non-working wood surfaces that do not require a protective film, such as salad bowls, butcher blocks, chopping boards, furniture (other than table tops), gun stocks, jewelry cases, wooden figurines, bowl turnings, etc. Can be used on wood floors; see our flooring application guide for instructions. DRY/CURE TIME: 4 hours between coats when thinned. Wait a full 24 hours for the final coat to dry. Allow the coating to cure for a minimum of 7 days before subjecting it to use or water. Full cure is achieved at 30 days. COVERAGE/THINNING: Waterlox 100% Pure Tung Oil is infinitely soluble in regular or odorless Mineral Spirits, (do NOT use low-odor, green or low-VOC types of solvents), paint thinner and citrus solvent. Do not thin with Acetone or Lacquer Thinner. It is advisable to thin the product at least 3:1 for ease of application. If and when you thin the product, you are changing the VOC Content; be sure to check with your local authorities with regard to VOC limits for Architectural projects. 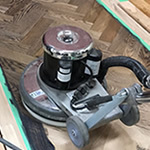 SURFACE PREPARATION & APPLICATION: Waterlox 100% Pure Tung oil may alter the appearance, conduct a test by applying all intended coats on a scrap piece or an inconspicuous area before beginning. USE ON BARE WOOD ONLY. Proper sanding techniques should be followed prior to using, finish sand to a 100-150 grit. NEW WOOD APPLICATION: Use a china-bristle brush, steel wool or a lint-free cloth to apply Waterlox 100% Pure Tung Oil. Allow a thin coat of the oil to penetrate for 10 minutes and then wipe off the excess oil using a clean, lint-free cloth. Allow to dry for at least 4 hours. Continue to apply the oil in thin coats (wiping off excess oil) until desired fill or gloss is achieved. Wait 24 hours for the final coat to dry.